Panelists discussing the challenges for gender equality in the media included, from left, Phumzile Mlambo-Ngcuka, Irina Bokova, Karin Achtelstetter and Colleen Lowe Morna. The first week of the United Nations Commission on the Status of Women offered a plethora of programming and discussions on gender equality in many different areas – education, politics, the environment, security and more. Several sessions attended by the School Sisters of Notre Dame delegation focused on how media and storytelling hold the potential to promote peace and gender equality. Breaking Persistent Challenges for Gender Equality in Media featured a panel that included Irina Bokova, director-general of UNESCO; Phumzile Mlambo-Ngcuka, U.N. under-secretary general and executive director of UN Women; Lee Jim Sook, president of Munhwa Broadcasting Company in Korea and Colleen Lowe Morna, chief executive officer of Gender Links and chair of the Global Alliance on Media and Gender. 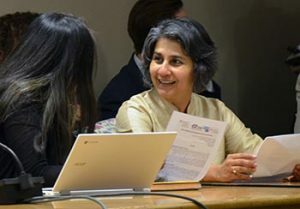 Mallika Dutt, founder of Breakthrough, was a panelist at sessions on the role of media in attaining SDG #16 and on storytelling. 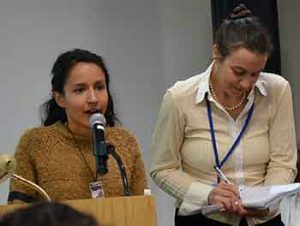 Berta Zúniga Cáceres, left, shares her story about her mother, an environmental activist in Honduras who was murdered earlier this month. “The reality of gender-based inequalities and systematic marginalization in the media is well known,” said Karin Achtelstetter, the panel moderator and general secretary of the World Association for Christian Communication. The 2015 Global Media Monitoring Report states that it could take 77 years before gender equality in the media is reached – far beyond the 2030 target for achieving the Sustainable Development Goals (SDGs). The slow progress is troubling, especially in relation to achieving the Sustainable Development Goals, Bokova said. One way to have an impact is to harness the power of storytelling, to give voice to the voiceless, the panelists said. And in a later session on The Power of Stories in Preventing Violence Against Women, the presenters shared examples of how stories put a face on statistics, exposed and interrupted the status quo and positioned personal challenges as societal. Stories are powerful vehicles that share joy, build bridges, foster connections and spark empathy. They can open hearts, change minds, transform cultural norms and stimulate new laws. Her mother, Cáceres said, taught her not to have prejudices but to celebrate and learn from the differences in the world.